"Before one can run, one must learn to walkabout." To celebrate the opening of Walkabout Australia, San Diego Zoo Safari Parks new interactive safari, agency M&C Saatchi LA has launched Safari, Aussie Style. 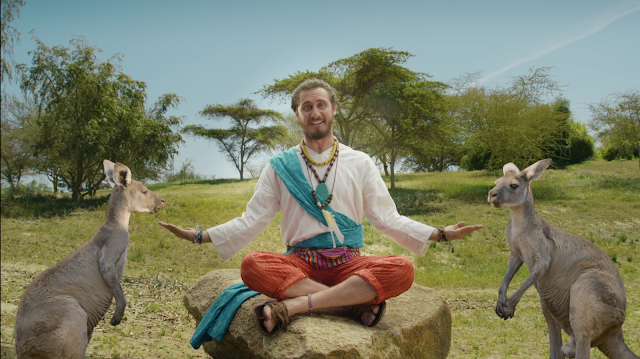 Embracing the Way of the Roo. The campaign is guided by Kanguru, an endearingly free-spirited, bohemian Australian with a Southern Californian flower-child attitude. Along the Walkabout, he encounters some of the fauna that inspire his positive outlook. Visitors to Walkabout Australia can do the same, while they explore 3.6 acres of everything awesomely Aussie in four different habitats. Our Kanguru serves as an ambassador of fun. He is both silly and sincere in his delivery as he introduces everyone to the Way of the Roo, Walkabout Australia is an enlightened path of adventure with animals and memorable family fun, says Ted Molter, Chief Marketing Officer, San Diego Zoo Global. The print and out of home campaign highlights the interactive quality of the safari, presenting kids and animals together in a key art series awash with bold color. Elements from Way Of The Roo, were also integrated into a new AR App Danceabout Australia produced by Red Interactive, now featured within the AR Apps category within the Apple App Store. Walkabout Australia offers a safari experience with Australias extraordinary creatures on a scale that has never been done before. Eighty percent of Australias animal species are unique to the region, including the red-necked wallaby, western gray kangaroo, magpie goose, radjah shelduck and the freckled duck. Bringing species back from the brink of extinction is the goal of San Diego Zoo Global. As a leader in conservation, the work of San Diego Zoo Global includes on-site wildlife conservation efforts (representing both plants and animals) at the San Diego Zoo, San Diego Zoo Safari Park, and San Diego Zoo Institute for Conservation Research, as well as international field programs on six continents. The work of these entities is made accessible to children through the San Diego Zoo Kids network, reaching out through the Internet and in childrens hospitals nationwide. The work of San Diego Zoo Global is made possible by the San Diego Zoo Global Wildlife Conservancy and is supported in part by the Foundation of San Diego Zoo Global. M&C Saatchi LA is part of the M&C Saatchi Worldwide Network, the world's largest independent marketing agency. Named in the top five of Ad Age's Best Places To Work 2015, M&C Saatchi LA has produced iconic work for Ketel One, Crystal Cruises, Qantas Airways, EPSON, Pacific Life Insurance, 20th Century Fox, Netflix, the San Diego Zoo, UGG®, and Google. Heavenspot, M&C Saatchi Sports & Entertainment, Clear, M&C Saatchi PR and M&C Saatchi Mobile are part of the integrated offerings of the M&C Saatchi LA Group.